The nucleus tractus solitarii (NTS) is implicated in the control of breathing, but the neuronal phenotype and circuit mechanism involved in such a physiological function remain incompletely understood. This study focused on the respiratory role of paired-like homeobox 2b gene (Phox2b)-expressing NTS neurons and sought to determine whether selective stimulation of this set of neurons activates breathing in male mice. A Cre-dependent vector encoding a Gq-coupled human M3 muscarinic receptor (hM3Dq) was microinjected into the NTS of Phox2b-Cre transgenic mice. The hM3Dq-transduced neurons were pharmacologically activated in conscious mice while respiratory effects were measured by plethysmography. We demonstrate that chemogenetic stimulation of Phox2b-expressing NTS neurons significantly increased baseline minute volume via an increase in respiratory frequency rather than tidal volume. Chemogenetic stimulation also synergized with moderate CO2 stimulation to enhance pulmonary ventilatory response. Selective ablation of Phox2b-expressing NTS neurons notably attenuated a hypercapnic ventilatory response. Moreover, histological evidence revealed that stimulation of Phox2b-expressing NTS neurons increased neuronal activity of the preBötzinger complex. Finally, we presented the neuroanatomical evidence of direct projection of Phox2b-expressing NTS neurons to putative respiratory central pattern generator. Overall, these findings suggest that selective activation of Phox2b-expressing NTS neurons potentiates baseline pulmonary ventilation via an excitatory drive to respiratory central pattern generator and this group of neurons is also required for the hypercapnic ventilatory response. SIGNIFICANCE STATEMENT The nucleus tractus solitarii (NTS) has been implicated in the control of breathing. The paired-like homeobox 2b gene (Phox2b) is the disease-defining gene for congenital central hypoventilation syndrome and is restrictively present in brainstem nucleus, including the NTS. Using a chemogenetic approach, we demonstrate herein that selective stimulation of Phox2b-expressing NTS neurons vigorously potentiates baseline pulmonary ventilation via an excitatory drive to respiratory central pattern generator in rodents. Genetic ablation of these neurons attenuates the hypercapnic ventilatory response. We also suggest that a fraction of Phox2b-expressing neurons exhibit CO2 sensitivity and presumably function as central respiratory chemoreceptors. The methodology is expected to provide a future applicability to the patients with sleep-related hypoventilation or apnea. Congenital central hypoventilation syndrome (CCHS) is a rare autosomal dominant disease defined by a failure in autonomic control of breathing. CCHS patients characteristically exhibit alveolar hypoventilation with diminutive tidal volume (TV) and respiratory rate more frequently during sleep (Weese-Mayer et al., 2010). The paired-like homeobox 2b gene (Phox2b) is the disease-defining gene for CCHS, and the mutation of this gene in animal models results in hypoventilation; the Phox2b gene encodes a transcription factor that plays a critical role in the development of autonomic nervous system (Pattyn et al., 1999; Dauger et al., 2003; Tiveron et al., 2003). Phox2b is restrictively present in the afferent pathways of autonomic reflexes, including the nucleus tractus solitarii (NTS) and retrotrapezoid nucleus (RTN), all these regions presumed to contain respiratory chemoreceptors, whereas Phox2b is absent in the respiratory central pattern generator (rCPG) (Dubreuil et al., 2009a). The contribution of Phox2b-expressing NTS neurons to breathing control is incompletely understood. The NTS, located in the dorsal medulla, integrates the afferent information from both respiratory and cardiovascular receptors (Guyenet, 2006; Dean and Putnam, 2010) and therefore plays a key role in cardiorespiratory regulation. Although several lines of evidence have demonstrated the role of NTS in the control of breathing, very little is known regarding the neurochemical phenotype of respiration-related NTS neurons. Recently, the respiratory role of Phox2b-expressing medullary neurons has been intensively studied. RTN neurons failed to develop in transgenic mice with mutated form of Phox2b, and these mice displayed impaired hypercapnic ventilatory responses, in favor of a crucial role of RTN neurons in the control of breathing (Dubreuil et al., 2009b). Optogenetic stimulation of Phox2b-expressing RTN neurons could activate breathing (Abbott et al., 2009; Kanbar et al., 2010); by contrast, lesions of this set of neurons produced an attenuation of the central respiratory chemoreflex (Takakura et al., 2008). In addition, the majority of Phox2b-expressing RTN neurons exhibited an intrinsic pH sensitivity (Lazarenko et al., 2009; Wang et al., 2013a) that was primarily mediated by G protein-coupled receptor 4 and TASK-2 channels (Wang et al., 2013b; Kumar et al., 2015). More recently, we found that chronic lesions of Phox2b-expressing NTS neurons had no effect on resting pulmonary ventilation but considerably impaired the central respiratory chemoreflex; furthermore, a subset of Phox2b-expressing neurons also manifested an intrinsic pH sensitivity (Fu et al., 2017). Nevertheless, these findings are not sufficient to conclude that activation of Phox2b-expressing NTS neurons modulates baseline pulmonary ventilation. More importantly, lack of circuit mechanism hinders our understanding of whether Phox2b-expressing NTS neurons modulate breathing via an excitatory drive to rCPG. Here, we used chemogenetics, genetic apoptosis, immunohistochemistry, and plethysmography to determine whether stimulation of Phox2b-expressing NTS neurons activated breathing, and whether these neurons were required for a hypercapnic ventilatory response in a Phox2b-Cre transgenic mouse line. We found that chemogenetic stimulation of Phox2b-expressing neurons vigorously increased baseline pulmonary ventilation. In contrast, selective ablation of these neurons had no effect on baseline ventilation but remarkably attenuated the hypercapnic ventilatory response. All experiments were conducted using a bacterial artificial chromosome Phox2b-Cre transgenic mouse line (IMSR catalog #JAX:016223, RRID:IMSR_JAX:016223) that was previously generated (Scott et al., 2011). Mice were housed under controlled temperature (21 ± 1°C) and humidity (50 ± 10%) with a fixed 12 h light/12 h dark cycle, with ad libitum access to food and water. Mice were all on a C57BL/6 genetic background and ∼8 weeks old at the beginning of the experiments. Male mice were used in all experiments. The animal was used in accordance with Guide for the care and use of laboratory animals, and was approved by Animal Care and Ethical Committee of Hebei Medical University. Cre-dependent adeno-associated viral vectors with serotype 2 (AAV2) and their delivery. The AAV2 (titer: 1012 virus molecules per milliliter) was obtained from GeneChem. The vectors are characterized by an enhanced version of the Gq-coupled human M3 muscarinic receptor (hM3Dq), a type of Designer Receptors Exclusively Activated by Designer Drugs, fused with a mCherry tag under the control of the elongation factor 1α (EF1α) promoter (AAV-EF1α-DIO-hM3Dq-mCherry). The hM3Dq-mCherry sequence is flanked by double lox sites with an inverted reading frame that requires Cre-mediated recombination and inversion into the sense direction for functional expression. At the beginning, the AAV2-EF1α-DIO-mCherry (titer: 1012/ml) was used to verify the specificity of Cre recombinase expression in Phox2b-expressing neurons. Phox2b-Cre mice were subjected to bilateral microinjections of the virus into the NTS. The protocol for injections has been depicted previously (Fu et al., 2017). Shortly, the mice were anesthetized with pentobarbital sodium (60 μg/g, i.p.). Depth of anesthesia was evaluated by an absence of corneal and hindpaw withdrawal reflexes. Additional anesthetic was administered as necessary (30% of the original dose, i.p.). All surgical procedures were performed under strict aseptic conditions. After anesthesia, the mouse was placed prone on a stereotaxic apparatus (Stoelting), and body temperature was maintained at 37°C using a heating pad and a blanket (RWD). The occipital craniotomy was performed to expose dorsal surface over the NTS. A glass micropipette (25 μm) filled with the viral vector was microinjected into the dorsal and intermediate NTS at the level of calamus scriptorius (approximate stereotaxic coordinates: mediolateral ±0.3 mm, anteroposterior 0.2 mm, dorsoventral −0.2 mm; mediolateral ±0.4 mm, anteroposterior 0.3 mm, dorsoventral −0.3 mm) using a syringe pump (Harvard Apparatus). A total volume of 400 nl (100 nl per injection) was injected into the NTS. After injection, the mice received injections of antibiotic ampicillin (125 mg/kg, i.p.) and the analgesic ketorolac (4 mg/kg, i.p.). Mice were then given a 4 week recovery before breathing measurements. The surgical procedures and virus injections produced no observable behavioral effects, and these mice gained weight normally. Chemogenetic stimulation of the NTS. The ventilatory response was measured in conscious, freely moving mice using whole-body plethysmography (EMKA Technologies) as described previously (Kumar et al., 2015; Fu et al., 2017). Briefly, mice were placed in the chamber ahead of the testing protocol for at least 2 h (for acclimation). A mass flow regulator provided quiet, constant, and smooth air mixture through the animal chamber (0.5 L/min). Mice were exposed to 100% O2 throughout the whole experiments to inactivate peripheral respiratory chemoreceptors. Breathing parameters, comprising respiratory frequency (RF, breaths/min), TV (μl/g), minute volume (MV, μl/min/g), inspiration time (Ti), and expiration time (Te), were measured during behavioral quiescence and regular breathing. MV was calculated as the product of the RF and TV, normalized to body weight (grams). For analysis of the acute hypercapnic ventilatory response, we sampled 10 consecutive epochs (200 s, representing ∼500 breaths at rest) that showed the least interbreath irregularity during the plateau period. Baseline ventilation was initially determined before injection of the activator of hM3Dq, clozapine N-oxide (CNO, 1 mg/kg, dissolved in saline, i.p. ), followed by consecutive measurements for 4 h to assess the stimulatory effect of CNO. In some instances, to examine the additive effect of CO2 and CNO, a hypercapnic exposure was conducted under hyperoxic conditions before and after CNO administration. Breathing parameters were measured during sequential treatments with 100% O2, 5% CO2, 8% CO2, CNO (100% O2), CNO plus 5% CO2 and plus 8% CO2 in each mouse. Ventilatory flow signals were recorded, amplified, digitized, and analyzed using IOX 2.7 (EMKA Technologies) to determine ventilatory parameters over sequential 20 s epochs (∼50 breaths). The response to hypercapnia was determined from the peak MV (20 s epoch) following the hypercapnic exposure. At the end of the experiments, some animals were anesthetized with an overdose of pentobarbital and perfused transcardially for histological experiments. Microinjections of the viral vector into the NTS were performed using the similar protocol as depicted above. Shortly, Cre-dependent AAV vectors encoding a genetically engineered Casp3 gene (AAV-CAG-DIO-taCasp3-TEVp, 100 nl per injection, 4 injections) and mCherry (AAV-CAG-DIO-mCherry, control vector) were bilaterally injected into the intermediate and caudal NTS, respectively. Mice were then given a 4 week recovery before plethysmography experiments. To validate ablation of Phox2b-expressing neurons, the quantitative PCR (qPCR) was performed to analyze the level of Phox2b mRNA in the NTS. Shortly, after anesthetization, the NTS tissues of mice were rapidly dissected out and preserved in lysate solution. RNA purification columns (Eastep Super total RNA extract kit, Promega) were used to purify RNA, followed by reverse transcription (Super Script III First-Strand Synthesis System for RT-PCR, Invitrogen). The qPCR was performed on ABI Quant Studio 6 flex system (1 cycle at 50°C for 2 min; 1 cycle at 95°C for 10 min; 40 cycles at 95°C for 15 s and 60°C for 1 min; 1 cycle at 95°C for 15 s; 1 cycle at 60°C for 1 min; 1 cycle at 95°C for 15 s) using SYBR Green reaction mix (Applied Biosystems). GAPDH was used as an internal reference. The following primers were used: GAPDH forward primer: 5′-GCAAATTCAACGGCACAGTCAAGG-3′, reverse primer: 5′-TCTCGTGGTTCACACCCATCACAA-3′; Phox2b forward primer: 5′-TACGCCGCAGTTCCATACAAACTC-3′, reverse primer: 5′-TCTTTGAGCTGCG CGCTTGTGAAG-3′. The immunohistochemical protocol has been depicted previously (Kumar et al., 2015). Briefly, mice were deeply anesthetized with urethane (1.8 g/kg, i.p.) and transcardially perfused with 200 ml of chilled saline, followed by 4% phosphate-buffered PFA (0.1 m, pH 7.4). The mouse was decapitated, and the brainstem was dissected out, stored in the perfusion fixative at 4°C for 48 h, and immersed in 30% sucrose in PBS at 4°C for at least 2 d. A series of 25 μm sections was obtained with a cryostat (CM1950; Leica Microsystems). The tissue sections were washed with PBS for 3 times, and then immersed in blocking buffer (2% BSA in PBS) for 30 min at room temperature. For immunofluorescence staining, the sections were incubated with primary antibodies at 4°C overnight. After rinsing with PBS again, the sections were then incubated with secondary antibodies for 1 h at room temperature. Finally, the sections were mounted and examined with a fluorescence microscope (DM6000B, Leica Microsystems) or confocal microscope (LSM800, Carl Zeiss). For cFos-based histological analysis of CNO-stimulated NTS neurons, the hM3Dq-injected mice were placed in the chamber, exposed to 100% O2, and then intraperitoneally injected with CNO (1 mg/kg). After 45 min, the mice were anesthetized and perfused transcardially with fixative for subsequent histological processing as described above. 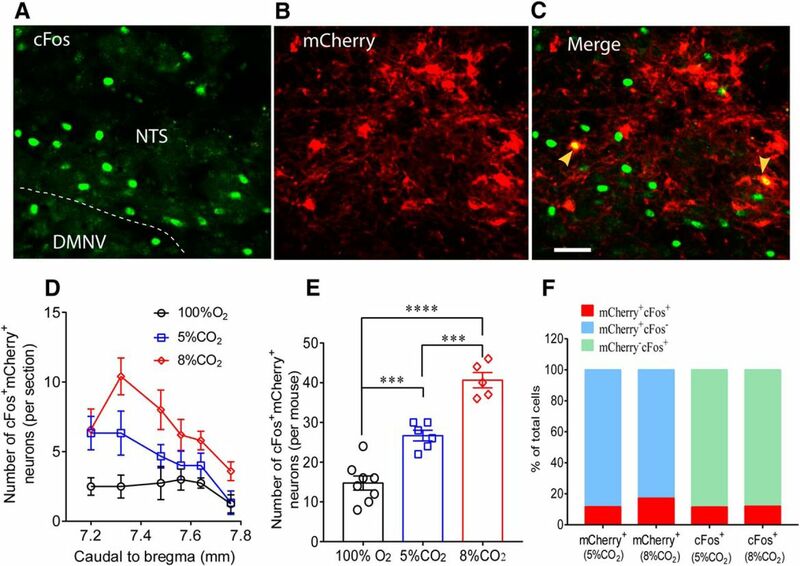 For cFos-based histological analysis of the proportion of CO2-activated mCherry-transduced NTS neurons, mice were placed in the chamber and correspondingly exposed to 100% O2 or 5% CO2 or 8% CO2 (balance O2) for 50 min, followed by 100% O2 for 60 min. The mice were then killed for histological experiments. For cFos-based histological analysis of whether chemogenetic stimulation of Phox2b-expressing NTS neurons affected neuronal activity of preBötzinger complex (preBötC), the transcardial perfusion and histological protocols were performed 120 min after injections of CNO or saline in hM3Dq-injected mice. 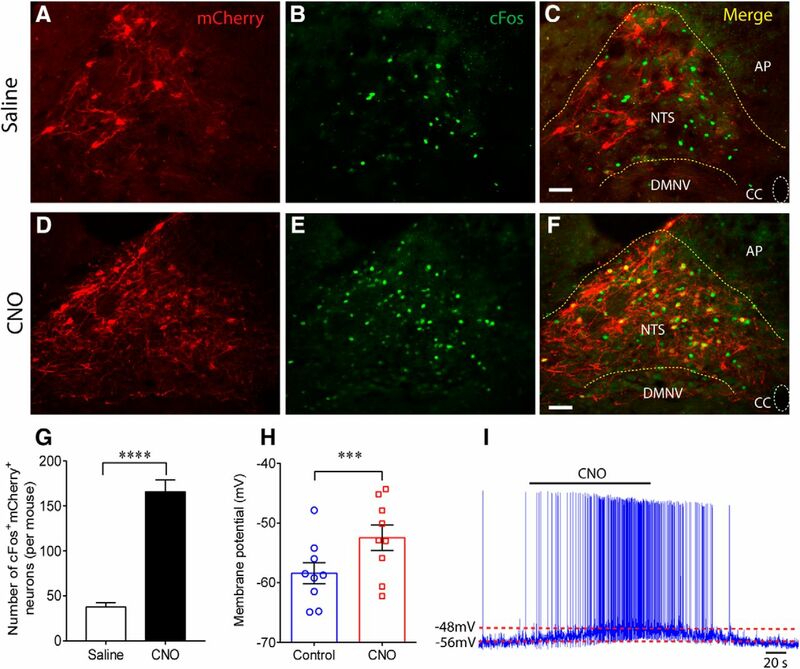 To calculate the proportion of CO2- or CNO-stimulated mCherry-transduced neurons in the NTS, cell counts were performed in 6 coronary sections of each mouse. The rostrocaudal position of each coronary section was determined (bregma: −7.20 to −7.76 mm, approximately corresponding to intermediate and caudal NTS) according to the atlas of The mouse brain in stereotaxic coordinates (Paxinos and Franklin, 2003). To count cFos-expressing preBötC neurons, five consecutive coronary sections (bregma: −6.72 to −7.20 mm, separation by 90 μm) were collected for histology. The Phox2b staining was conducted together with cFos to easily determine the location of preBötC neurons. The cFos was detected with a rabbit antibody (dilution 1:400, Cell Signaling Technology, catalog #2250, RRID:AB_2247211) and corresponding secondary antibody (dilution 1:200, Jackson ImmunoResearch Laboratories, catalog #711-095-152, RRID:AB_2315776). The Phox2b was detected with a mouse monoclonal antibody (dilution 1:200, sc-376993; Santa Cruz Biotechnology) that was validated previously (Fu et al., 2017) and revealed with goat anti-mouse FITC (dilution 1:200, Jackson ImmunoResearch Laboratories, catalog #115-095-146, RRID:AB_2338599) or goat anti-mouse Cy3 (dilution 1:200, Jackson ImmunoResearch Laboratories catalog #115-165-003, RRID:AB_2338680). Images were acquired and processed with the Application Suit (Leica Microsystems). Protocols have been described previously in detail (Wang et al., 2013b). Briefly, the mice that received AAV-EF1α-DIO-hM3Dq-mCherry were deeply anesthetized with 5% pentobarbital sodium (1.5 ml/kg) and decapitated. Brainstem coronary slices (220–250 μm, thickness) were cut quickly, recovered for 1 h, and subsequently transferred into a recording chamber for electrophysiological experiments. The mCherry-labeled neurons were chosen and whole-cell recordings were made using a Multiclamp 700B amplifier and a Digidata 1440A analog-to-digital converter (Molecular Devices). CNO was bath-applied at a final concentration of 30 μm. Recordings of membrane potential were obtained by whole-cell current clamp. Statistical analysis was done using Prism (GraphPad Prism, RRID:SCR_002798). Values were reported as mean ± SEM. To compare the differences within and between groups, we used paired or unpaired Student's t test, or one- or two-way ANOVA with the appropriate post hoc tests. Differences with p < 0.05 were considered statistically significant. We used a previously generated BAC transgenic mouse line expressing Cre recombinase under the control of Phox2b-specific promoter (Scott et al., 2011). To chemogenetically activate Phox2b-expressing NTS neurons in vivo, Cre-inducible AAV vectors encoding hM3Dq were microinjected into the NTS in Phox2b-Cre mice (Fig. 1A). The phenotype of the hM3Dq-mCherry-transduced neurons was examined by immunohistochemistry. 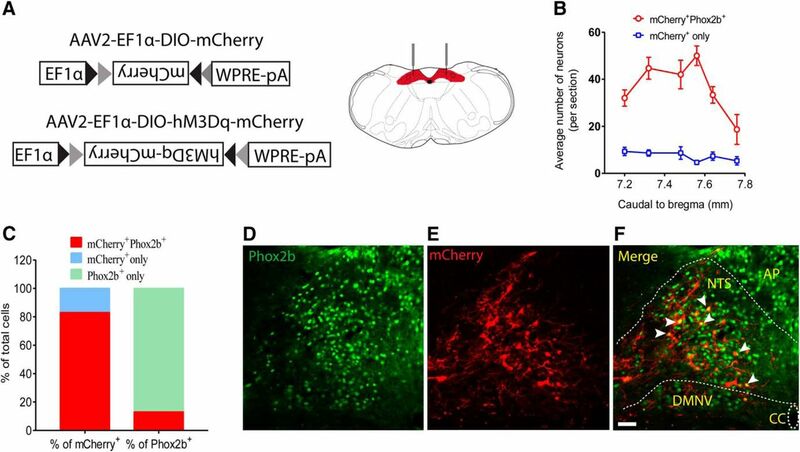 As shown in Figure 1B, C, based on cell counts obtained in 6 mice, the mCherry+Phox2b+ neurons accounted for ∼83% of total number of mCherry+ neurons and for ∼13% of Phox2b+ neurons. In addition, the majority of transduced neurons (∼94%) were located in the NTS (Fig. 1D–F), so the remaining (∼6%) in dorsal motor nucleus of vagus (data not shown). Validation of viral transfection in a Phox2b-Cre mouse line. A, Stereotaxic delivery of AAVs encoding Cre-dependent hM3Dq-mCherry or mCherry into the NTS in Phox2b-Cre mice. B, Rostrocaudal distribution of mCherry+Phox2b+ and mCherry+ NTS neurons. Cell counts were obtained in 6 coronary sections (25 μm) from each mouse (n = 6). C, Quantification of the percentage of mCherry+Phox2b+ neurons based on cell counts shown in B. The mCherry+Phox2b+ neurons accounted for ∼83% of total number of mCherry+-expressing neurons and for ∼13% of Phox2b+-expressing neurons. D–F, Most mCherry-transduced cells are Phox2b-positive. The merged photomicrograph was derived from Phox2b immunoreactivity (green, D) and mCherry (red, E). White arrows indicate the overlap of Phox2b and mCherry. Scale bar, 25 μm. To validate the transduction and functionality of the hM3Dq vector, histological and electrophysiological assays were performed. Four weeks after injection of AAV-EF1α-DIO-hM3Dq-mCherry, mice were transcardially perfusion-fixed 45 min after treatment with the hM3Dq activator CNO (1 mg/kg, i.p.) or equal volume of saline. The hM3Dq activation of Phox2b-expressing NTS neurons was confirmed by showing immunoreactivity for cFos (cFos+) following CNO administration. Apparently, the number of CNO-stimulated cFos+mCherry+ neurons was far greater compared with that treated with saline (n = 5 for each, t(8) = 9.371, p < 0.0001; Fig. 2A–G). In electrophysiological experiments, acute brainstem slices were prepared and whole-cell patch-clamp recordings were made to test changes in membrane potential in hM3Dq-mCherry transduced neurons. Bath application of CNO (30 μm), instead of saline, produced a rapid reversible depolarization (n = 9, 6.0 ± 1.0 mV, t(8) = 6.07, p = 0.0003; Fig. 2H,I), indicating the excitatory effect of CNO on the transduced neurons. Collectively, these data confirm the high efficacy of chemogenetic activation of Phox2b-expressing neurons. Histomolecular and electrophysiological validation of hM3Dq transduction. A–F, Photomicrographs were acquired from Phox2b-Cre mice injected with the AAV2-EF1α-DIO-hM3Dq-mCherry vector. Expression of mCherry (red, A, D) and cFos (green, B, E) was visualized in the NTS region. The merged photomicrograph showed that administration of CNO (1 mg/kg, F) activated much more mCherry-transduced neurons compared with saline (C). Immunoreactivity for cFos indicated CNO-activated neurons. Scale bar, 25 μm. G, The number of cFos+mCherry+ neurons after CNO stimulation was greater compared with saline. Cell counts were acquired in 6 coronary sections (25 μm) from each Phox2b-Cre mouse (n = 5 for each group). ****p < 0.0001 (unpaired t test). H, Whole-cell patch-clamp data showing a depolarization after bath application of CNO (30 μm) in hM3Dq-transduced neurons (n = 9) in acute slices from Phox2b-Cre mice (n = 8). ***p = 0.0003 (two-tailed paired t test). I, Typical traces illustrating a membrane depolarization (∼6 mV) and an increase in firing rate when challenged by bath application of CNO. DMNV, Dorsal motor nucleus of vagus; AP, area postrema; CC, central canal. We next applied this chemogenetic approach to Phox2b-Cre mice transduced with hM3Dq or a control vector (AAV-EF1α-DIO-mCherry). Four weeks after vector injection, we performed plethysmography in conscious mice when they were quietly resting. 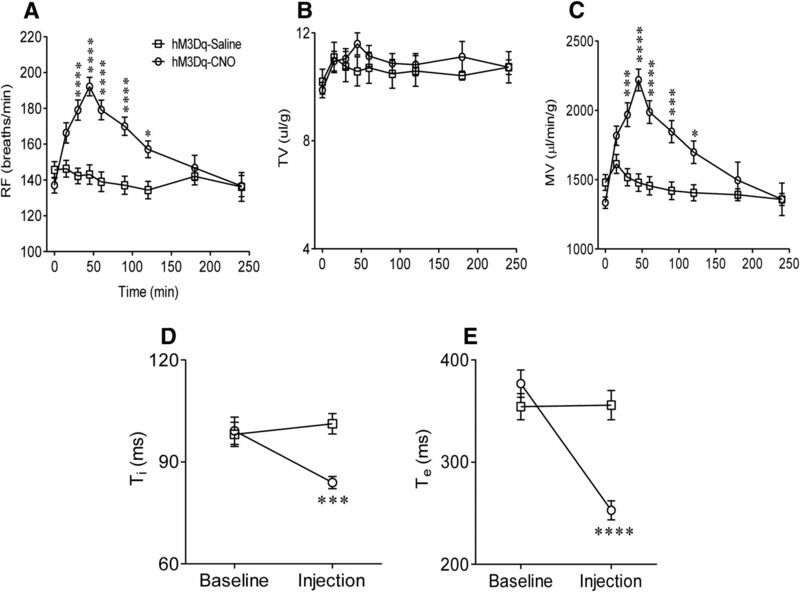 Breathing parameters, including RF, TV, MV, Ti, and Te, were compared between CNO and saline injections in hM3Dq-transduced Phox2b-Cre mice (n = 22 for saline, n = 32 for CNO). As shown in Figure 3A, injection of CNO, rather than saline, produced a long-lasting increase in RF. Such an increase commenced 15 min after the injection, peaked during 30–60 min (143 ± 5 vs 192 ± 5 breaths/min, saline vs CNO at ∼45 min, F(1,405) = 59.97, p < 0.0001), then returned to baseline level at ∼180 min. This remarkably stimulatory effect of CNO on RF persisted for at least 90 min. In contrast, no significant change in TV was found between two groups (Fig. 3B). Thereby, the increase in MV (1479 ± 63 vs 2219 ± 78 μl/min/g, saline vs CNO at ∼45 min, F(1,405) = 61.83, p < 0.0001; Fig. 3C) was solely due to an increase in RF. Meanwhile, administration of CNO, instead of saline, caused significant decreases in Ti (99 ± 4 vs 84 ± 2 ms, saline vs CNO at ∼45 min, F(1,102) = 6.193, p = 0.0006; Fig. 3D) and Te (377 ± 13 vs 253 ± 9 ms, saline vs CNO at ∼45 min, F(1,102) = 9.953, p < 0.0001; Fig. 3E). In control vector-injected mice (mCherry expression only), neither CNO nor saline produced significant changes in breathing parameters (data not shown). Thus, we conclude that selective stimulation of Phox2b-expressing NTS neurons potentiates baseline pulmonary ventilation. Potentiation of respiratory activity by activation of Phox2b-expressing neurons. In conscious hM3Dq-transduced Phox2b-Cre mice, injections of CNO (1 mg/kg, i.p.) produced greater increases in RF (A) and MV (C) relative to saline injections. Such an increase commenced 15 min after the CNO injection, peaked during 30–60 min, then fully returned to baseline level at ∼180 min. No significant change in TV (B) was found between two groups. Both Ti (D) and Te (E) were significantly reduced 45 min after injection of CNO compared with saline injection. Numbers of mice: n = 32 for the CNO group; n = 22 for the saline group. CNO versus saline (two-way ANOVA with Bonferroni's test): *p < 0.05; ***p < 0.001; ****p < 0.0001. Having assessed respiratory effects of Phox2b-expressing neurons, we further sought to determine whether chemogenetic activation of these neurons synergized with CO2 stimulation to strengthen a ventilatory response. As illustrated in Figure 4A, breathing parameters were measured during sequential treatments with 100% O2, 5% CO2, 8% CO2, CNO (100% O2), CNO plus 5% CO2 and plus 8% CO2 in each mouse (n = 18, except 9 of 18 mice for 8% CO2). Each measurement was made near the end of each experimental epoch. The time point for CNO effect was chosen based on the above results indicating that the strongest ventilatory response to CNO occurred at ∼45 min. As shown in Figure 4, compared with exposure to 100% O2, CNO injection, exposure to 5% or 8% CO2 (balance O2) all produced an obvious increase in RF (F(5,84) = 88.41, p < 0.0001 for both); 5% and 8% CO2 rather than CNO also notably increased the TV (F(5,84) = 64.8, p < 0.0001 for 5% and 8% CO2, p = 0.1935 for CNO; Fig. 4C). Consequently, all the above stimulations considerably increased the MV alone (F(5,84) = 119.2, p < 0.0001 for all except p = 0.002 for CNO; Fig. 4D). The combined application of CNO and 5% CO2 produced a greater increase in RF (p < 0.0001) and MV (p = 0.0081) than 5% CO2 only, with insignificant difference in TV (p = 0.9662; Fig. 4C). However, exposure to 8% CO2 plus CNO caused similar increases in RF, TV, and MV compared with 8% CO2 alone (p > 0.05 for all). Overall, chemogenetic stimulation of Phox2b-expressing NTS neurons synergizes with a moderate level of CO2 stimulation to enhance the ventilatory response. Additive effect of CNO and CO2 stimulations on pulmonary ventilation. A, Schematic diagram depicting the experimental protocol. RF was measured in response to sequential treatments with 100% O2, 5% and 8% CO2, CNO, CNO plus 5% and plus 8% CO2, respectively. The protocol was also applied to TV and MV. B–D, Effects of sequential stimulations on breathing parameters. Notably, the combined application of 5% CO2 and CNO elicited greater increases in RF and MV than 5% CO2 alone, with unchanged TV, whereas insignificant difference in breathing parameters was found between 8% CO2 alone and 8% CO2 plus CNO. Numbers of mice: n = 18 (except 9 of 18 mice for 8% CO2). One-way ANOVA with Holm–Sidak's multiple-comparisons test: **p < 0.01; ****p < 0.0001. ns, no significance. Our prior study has demonstrated that microinjection of a neurotoxin in the NTS to moderately destroy Phox2b-expressing neurons impaired a hypercapnic ventilatory response in conscious mice (Fu et al., 2017). To further verify whether this set of neurons was required for the central respiratory chemoreflex, we performed a loss-of-function study that used a genetic approach to ablate these neurons in Phox2b-Cre transgenic mice. To that end, the AAV-CAG-DIO-taCasp3-TEVp (AAV-CAG-DIO-mCherry for control) was injected in the NTS to selectively ablate Phox2b-expressing neurons (n = 10 for each group; Fig. 5A). The Casp3 activation has been evidenced to induce cell apoptosis (Resch et al., 2017; Zhao et al., 2017). As shown in Figure 5B, the Phox2b mRNA level in the NTS was significantly reduced (∼50%) in Casp3-injected mice (n = 4) than mCherry-injected mice (n = 3, p = 0.0018, mCherry vs Casp3; Fig. 5B), in favor of a moderate ablation of Phox2b-expressing neurons. During exposure to 100% O2, loss of Phox2b-expressing neurons did not affect baseline TV and MV, with the exception that RF was lower in Casp3-injected mice compared with mCherry-injected mice (F(1,9) = 4.933, p = 0.0061; Fig. 5C). Exposure to 2% CO2 remarkably increased the RF and MV in both groups, but the responses of RF and MV were reduced in Casp3-injected mice compared with the counterpart (p = 0.0127 for RF; F(1,9) = 11.11, p = 0.0353 for MV). When challenged by 5% and 8% CO2, although both TV and MV were apparently increased in two groups, the changes in two parameter values were markedly reduced in Casp3-injected mice relative to mCherry-injected mice (TV, F(1,9) = 3.913, p = 0.0007 for 5% CO2, p < 0.0001 for 8% CO2; MV, p < 0.0001 for both; Fig. 5D,E), with insignificant difference in RF (Fig. 5C). Together, we confirm that Phox2b-expressing NTS neurons are required for the hypercapnic ventilatory response. 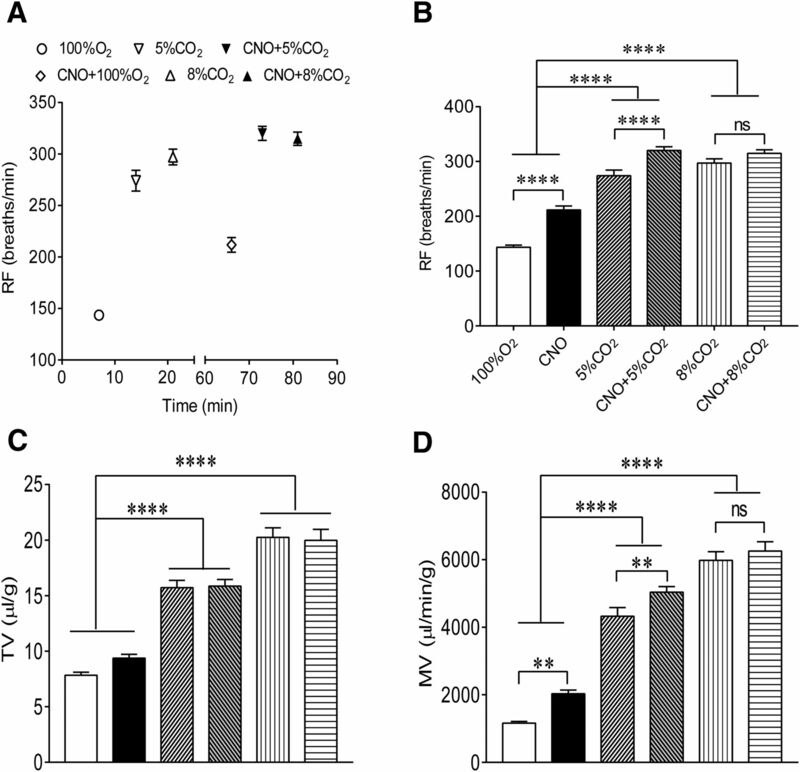 Effect of ablation of Phox2b-expressing neurons on hypercapnic ventilatory responses. A, Schematic diagrams illustrating a delivery of Cre-dependent Casp3 into the NTS. B, Quantitative analysis of Phox2b mRNA to validate selective ablation of Phox2b-expressing neurons using qPCR. n = 9 samples from 3 mice for mCherry; n = 12 samples from 4 mice for Casp3. **p < 0.01 (Mann–Whitney test). 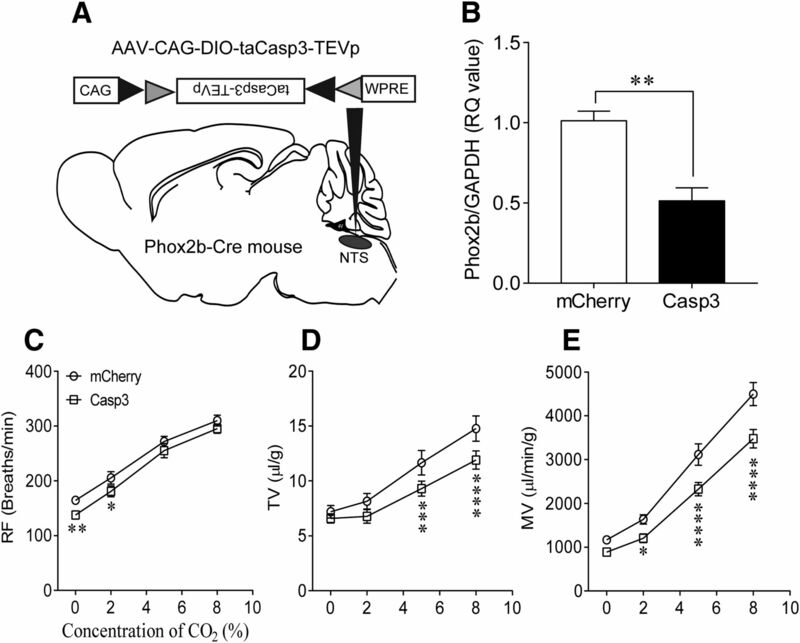 C–E, Ablation of Phox2b-expressing neurons blunted the hypercapnic ventilatory response. Exposure to higher concentrations of CO2 increased MV mainly via an increase in TV. However, MV was significantly reduced in Casp3-injected mice compared with mCherry-injected mice. n = 10 for each group. Two-way repeated-measures ANOVA with Bonferroni's multiple-comparisons test: *p < 0.05; **p < 0.01; ***p < 0.001; ****p < 0.0001. The Phox2b-expressing neurons stimulated by the chemogenetic approach are probably CO2-activated as implicated previously and act as central respiratory chemoreceptors (Fu et al., 2017). To determine whether hM3Dq-transduced neurons are CO2-sensitive, the immunoreactivity to cFos was examined in mCherry-transduced mice subjected to inhaling 100% O2 (n = 8), 5% (n = 6) and 8% CO2 (n = 5) for 50 min, respectively. As shown in Figure 6A–C, photographs indicate cFos (green) and mCherry (red) and coexpression (denoted by yellow arrows). Cell counts were conducted in 6 coronary sections from each mouse (Fig. 6D). Figure 6E demonstrates that the total number of cFos+mCherry+ neurons in mice treated with 8% CO2 (41 ± 2) is greater than that with 5% CO2 (21 ± 1, F(2,16) = 54.52, p = 0.0002) and 100% O2 (15 ± 2, p < 0.0001), so is the significant difference between 5% CO2 and 100% O2 (p = 0.0003), suggesting the presence of a fraction of CO2-activated Phox2b-expressing neurons. After data normalization, 5% and 8% CO2-activated cFos+mCherry+ neurons correspondingly account for ∼12% and 18% of all the mCherry+ neurons, as well as for ∼12% and 12% of all the cFos+ neurons (Fig. 6F). Hence, a small subset of mCherry-transduced neurons is CO2-activated and presumably functions as central respiratory chemoreceptors. CO2 sensitivity of Phox2b-expressing neurons. A–C, Immunofluorescence images showing expression of cFos and mCherry. The mouse was exposed to 8% CO2 for 50 min before immunohistological experiments. CO2-activated neurons were denoted by the immunoreactivity for cFos (green, A). The cFos+mCherry+ neurons (denoted by arrows, C) represented CO2-activated transduced neurons. Scale bar, 25 μm. D, Rostrocaudal distribution of cFos+mCherry+ neurons in 6 coronary sections from each mouse exposed to different concentrations of CO2. Number of mice: n = 8 for 100% O2; n = 6 for 5% CO2; n = 5 for 8% CO2. E, Comparisons in the average number of cFos+mCherry+ neurons of each group based on cell counts in D. F, Proportion of cFos+mCherry+ neurons in the total number of mCherry+ or cFos+ neurons. The calculations were made based on cell counts in E. ***p < 0.001 (one-way ANOVA with Tukey's test). ****p < 0.0001 (one-way ANOVA with Tukey's test). To examine whether chemogenetic stimulation of Phox2b-expressing NTS neurons increased baseline ventilation through activation of rCPG, the neuronal activity of preBötC was assessed by counting cFos-expressing cells. Cell counts were made in 5 consecutive coronary sections in hM3Dq-transduced mice treated with either saline or CNO (n = 4 for each group). The number of cFos+ neurons is larger in the CNO group than in the saline group (52 ± 6 vs 105 ± 5, saline vs CNO, t(6) = 8.803, p = 0.0001; Fig. 7A). As shown in typical confocal images in Figure 7B–D, cFos+ (green) neurons in the preBötC are located in ventral side of nucleus ambiguus. In addition, Phox2b (red) is not expressed in cFos+ neurons of preBötC. 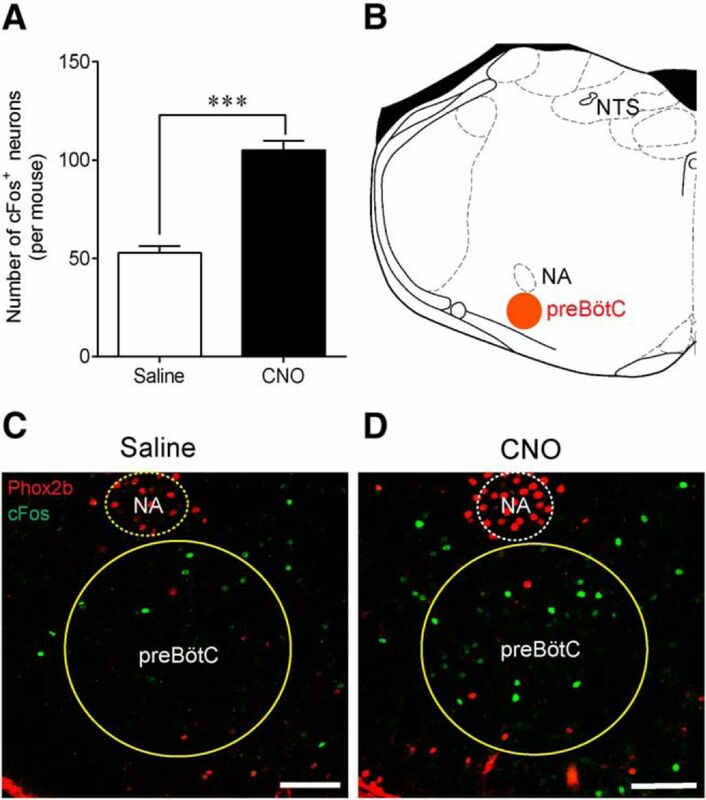 Apparently, the number of preBötC neurons activated by CNO is greater compared with saline injection. Thus, the present result suggests a circuit mechanism by which selective stimulation of Phox2b-expressing NTS neurons modulates the activity of preBötC neurons and finally potentiates baseline ventilation. Stimulation of Phox2b-expressing neurons activates preBötC neurons. A, Effect of Phox2b-expressing NTS neuron activation on neuronal activity of preBötC. The activated preBötC neurons were indicated by immunoreactivity to cFos. Cell counts were made in 5 coronary sections (25 μm thick; 6.72–7.20 mm caudal to bregma) in each hM3Dq-injected mouse treated with either CNO or saline. n = 4 for each group. ***p < 0.001 (unpaired t test). B, Schematic diagram indicating the coronary plane of a preBötC-containing medullary section (∼7 mm caudal to bregma) corresponding to C and D. C, D, Confocal images showing cFos-expressing preBötC neurons in mice treated with saline or CNO. Phox2b staining (red) was performed together with cFos (green) to assist with pinpointing the preBötC. No overlap of cFos and Phox2b was observed in preBötC cells. NA, Nucleus ambiguus. Scale bar, 100 μm. We further confirmed the neuroanatomical connections between Phox2b-expressing NTS neurons and ventral medullary areas involved in respiratory rhythm generation. As illustrated in Figure 8D–F, mCherry expression was evident, not only in neuronal somata, but also in the axons traveling from dorsal medulla to ventrolateral sides. 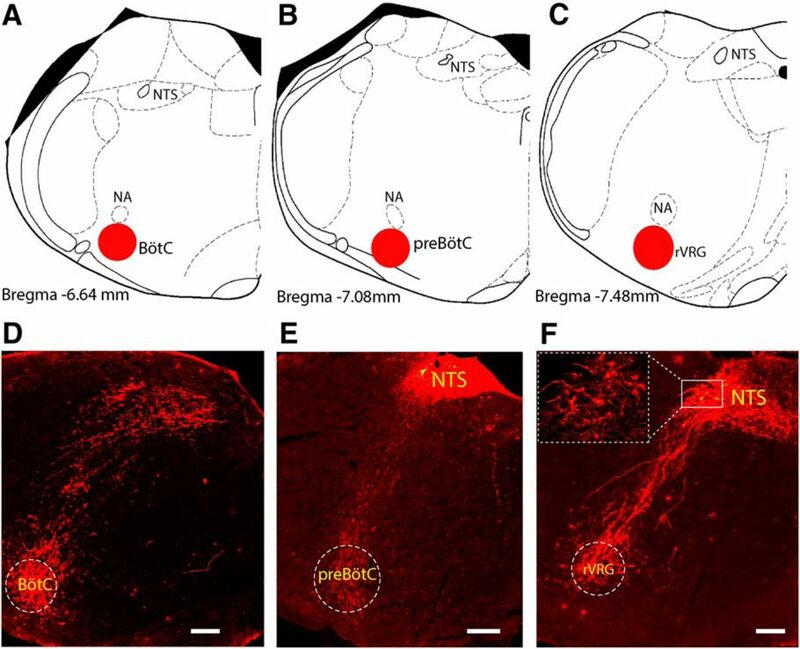 Numerous axons from Phox2b-expressing neurons terminated in respiratory compartments at three levels of coronary planes, approximately corresponding to BötC (Fig. 8A,D), preBötC (Fig. 8B,E), and the rostral part of ventral respiratory group (rVRG; Fig. 8C,F). Despite no functional evidence supporting the direct synaptic transmissions between mCherry-transduced axons and postsynaptic neurons from rCPG, we would confirm that these axons were directly projected from transduced NTS neurons because the viral vector used for tracing does not act transsynaptically. This projection pattern indicates that activation of Phox2b-expressing NTS neurons could modulate the activity of rCPG via direct synaptic connections. Projection of Phox2b-expressing neurons to the rCPG. A–C, Schematic profile illustrating the location of BötC (A), preBötC (B), and rVRG (C) in brainstem coronary sections. D–F, Photomicrographs showing the projection of mCherry-transduced neurons to the ventrolateral medulla, approximately corresponding to BötC (D), preBötC (E), and rVRG (F). The details in lined rectangle were enlarged in a dashed rectangle in F. Scale bar, 200 μm. We demonstrate that chemogenetic activation of Phox2b-expressing NTS neurons increases baseline MV via an increase in RF in conscious mice. In addition, Phox2b-expressing neuron activation synergizes with moderate level of CO2 stimulation to enhance pulmonary ventilation. In contrast, selective ablation of Phox2b-expressing neurons attenuates the hypercapnic ventilatory response. Moreover, chemogenetic stimulation of this set of neurons enhances neuronal activity in the preBötC. Finally, we present the neuroanatomical evidence of the direct projection of Phox2b-expressing NTS neurons to rCPG. Here, we attribute the chemogenetic effect on breathing to Phox2b-expressing neuron activation based on the following reasons. First, the majority of mCherry-transduced neurons (>83%) were Phox2b-positive, validating the high selectivity of viral transfection. Second, the mCherry-transduced neurons were primarily located in the NTS with a very small proportion in the dorsal motor nucleus of vagus. Third, immunohistological and electrophysiological experiments showed that CNO effectively activated mCherry-transduced neurons. In the present study, chemogenetic activation of Phox2b-expressing NTS neurons remarkably increased baseline MV solely due to an increase in RF. Similar studies in the NTS have been performed previously. An early report (Nattie and Li, 2002) found that CO2 dialysis in the NTS increased both RF and TV in awake rats; however, the neurochemical phenotypes of these NTS cells were unknown. The present study implicated the Phox2b-expressing neurons, which are definitely associated with CCHS. Recently, Huda et al. (2012) found that blockade of acid-sensitive ion channels in the NTS strongly reduced CO2-stimulated increase in burst frequency of the phrenic bursting activity in anesthetized rats. Consistent with our prior study demonstrating that chronic lesions of Phox2b-containing NTS neurons did not affect resting MV but strongly reduced CO2-stimulated increases in TV and MV (Fu et al., 2017), the present finding also showed that selective ablation of Phox2b-expressing neurons impaired the hypercapnic ventilatory response primarily via affecting TV. The above effects can be summarized in three modes: the NTS regulates (1) RF only, (2) respiratory amplitude only, and (3) both RF and amplitude. Here we emphasize the consequence of respiratory output in response to Phox2b-expressing neuron stimulation, although such effects may be achieved through altering either RF or TV, or both. So far, it seems difficult to perform a molecular dissection of RF- and amplitude-regulating neurons. The two parameters may be differentially modulated by the following factors: neurochemical phenotype of neurons involved, anesthetized versus conscious animals, normocapnic versus hypercapnic conditions, and gain-of-function versus loss-of-function experiments. In the present study, the Phox2b neuron-stimulated potentiation of MV via mobilizing RF suggests a resting RF reserve at the level of NTS. In animals with intact neural circuits in either NTS or RTN, exposure to CO2 increased MV via mobilizing both RF and TV (Nattie and Li, 2002; Kumar et al., 2015; Fu et al., 2017). The CO2-stimulated ventilatory response may involve activation of several types of neurons, such as glutamatergic, GABAergic, and catecholaminergic neurons. In loss-of-function experiments, the stimulatory effect of CO2 on RF or TV may be diverse because of perturbation of neural circuits within the NTS or between the NTS and rCPG. Our prior and present findings show that ablation of Phox2b neurons attenuated the hypercapnic ventilatory response primarily via a reduction of TV rather than RF. Similar results were observed in the locus ceruleus. Selective lesions of LC noradrenergic neurons significantly blunted hypercapnic ventilatory responses via a reduced TV instead of RF (Biancardi et al., 2008); however, in another study, severe destruction of locus ceruleus catecholaminergic neurons produced an inhibitory effect on the hypercapnic ventilatory response via a diminished RF rather than TV (Li and Nattie, 2006). Thus, more studies are required for molecular dissection of neural circuits involved in differential regulation of pulmonary ventilation. The loss-of-function experiment demonstrates that selective ablation of Phox2b-expressing neurons attenuated the hypercapnic ventilatory response. Chemosensitive NTS neurons have been implicated in the regulation of breathing previously (Dean and Putnam, 2010). Nevertheless, it remains elusive regarding the neuronal phenotype. Accumulated in vitro studies demonstrated a depolarization or firing increase during physiological acidification in ∼35% of phenotype-unrevealed neurons (Dean et al., 1990), ∼40% (acid-sensitive ion channel-containing) of neurons (Huda et al., 2012), or 43% of Phox2b-expressing neurons in the NTS (Fu et al., 2017). According to analysis of cell count, exposure to 5%–8% CO2 produced activation of at least 12% of Phox2b-expressing neurons in this transgenic mouse line. These neurons are, to a large extent, critical because they are presumed to provide an excitatory drive to rCPG by sensing excessive CO2/H+ and, therefore, modulate a ventilatory response. Overall, our prior and present findings suggest that Phox2b-expressing NTS neurons are required for the hypercapnic ventilatory response. Nevertheless, our work is not sufficient to conclude that Phox2b-expressing NTS neurons are important chemoreceptors. In other words, Phox2b does not seem a specific chemoreceptor signature in the NTS. A prior study has shown that CO2/H+-sensitive caudal NTS neurons responded to focal ATP application in brainstem slices; however, these chemosensitive neurons were Phox2b-deficient (Sobrinho et al., 2014), raising the possibility that Phox2b-deficient NTS neurons probably function as respiratory chemoreceptors. In addition, we realize that destruction of any element of the respiratory circuit would likely diminish breathing and CO2 sensitivity, and this is consistent with the present evidence indicating that selective activation of Phox2b-expressing NTS neurons increased cFos in the preBötC. Thus, future studies are necessary to identify the more specific marker of central chemoreceptor neurons or the subset of Phox2b-expressing chemosensitive neurons in the NTS. Interestingly, chemogenetic stimulation of Phox2b-expressing neurons in the NTS synergized with moderate level of CO2 (5%) exposure to enhance the ventilatory response, whereas no significant change in MV was found between 8% CO2 alone and 8% CO2 plus CNO stimulations. These effects were attributed to the following reasons. On one hand, in relative to systemic stimulation of CO2, activation of Phox2b-expressing NTS neurons has a limited capability for an enhancement of ventilatory responses. On the other hand, a number of Phox2b-expressing NTS neurons could be recruited simultaneously by both CO2 and CNO stimulations; in particular, the number of shared Phox2b neurons is presumed to be greater in response to a higher level of CO2 (8%) despite paucity of direct evidence presented herein. We presume that Phox2b-expressing NTS neurons directly modulate rCPG neurons based on the following experiments. First, neuroanatomical evidence supported a direct projection of Phox2b-expressing neurons to medullary ventrolateral respiratory column regions, including rVRG, preBötC, and BötC. Second, according to cFos-based analysis of cell count in the ventrolateral medulla, more preBötC neurons were activated after selective stimulation of Phox2b-expressing neurons. Third, activation of Phox2b-expressing neurons markedly reduced both Ti and Te, which was probably ascribed to a regulatory effect of Phox2b-expressing neuron activation on rCPG activity. The notion is also consolidated by prior studies demonstrating extensive projections from NTS to the three serially arrayed regions (Geerling and Loewy, 2006; Rinaman, 2010; Alheid et al., 2011), whereas the phenotype of NTS projection neurons remains unknown. Nevertheless, the NTS neuron may influence rhythm-generating circuits in the preBötC via indirect links. Obvious candidates consist of projections from NTS to the parabrachial and Kölliker–Fuse nuclei (Song et al., 2011), rVRG (Moreira et al., 2007a), and RTN (Takakura et al., 2006, 2007; Moreira et al., 2007b), ultimately affecting the activity of preBötC neurons. The present study does not rule out the possibility that stimulation of Phox2b-expressing neurons activated breathing via indirect links. Here, chemogenetic stimulation of Phox2b-expressing NTS neurons produced a long-lasting potentiation of baseline pulmonary ventilation, identifying a neuronal subtype in the NTS for the control of breathing. The CCHS, mainly characterized by nocturnal sustained hypoventilation caused by mutant Phox2b (Weese-Mayer et al., 2010), may be partially due to the loss (70%) of RTN neurons (Dubreuil et al., 2008). Meanwhile, in the mouse model, Phox2b-expressing neurons in the NTS were anatomically intact (Dubreuil et al., 2008), reminiscent of a notion that selective activation of Phox2b-expressing NTS neurons by either molecular manipulation or pharmacological stimulation could improve hypoventilation presumably due to loss of RTN neurons. In conclusion, selective stimulation of Phox2b-expressing NTS neurons significantly potentiates baseline pulmonary ventilation. These neurons are also required for the hypercapnic ventilatory response. The circuit mechanism underlying the above effects is presumed to involve an excitatory drive of Phox2b-expressing neurons to neuronal activity of rCPG. These findings would help us better understand neural circuits of respiratory control and present a clue to treatment of sleep-related hypoventilation or apnea. This work was supported by National Natural Science Foundation of China Grants 31371166 and 31571174 to S.W., Hebei Natural Science Foundation Grant C2014206303, and Hebei Province Government Grant CXZZBS2017102 to C.F. We thank Professor Sergey Kasparov for his comments on an earlier version of the manuscript. (2003) The mouse brain in stereotaxic coordinates, Ed 2. San Diego: Academic.